BUDDY movies rely on screen chemistry just as much as conventional romances do. Ryan Reynolds and Samuel L. Jackson are a match made in studio heaven - even when they are working with substandard material, as is the case here. Sparks literally fly between their mismatched characters in The Hitman's Bodyguard, a semiautomatic bromance directed by Australia's Patrick Hughes (Red Hill, The Expendables 3). There's nothing particularly original or subtle about Tom O'Connor's screenplay, which made the 2011 Black List, (a highly regarded annual survey of the best scripts yet to be produced). This is a film made for Jim Beam drinkers rather than craft beer aficionados - although it does boast a few unexpected flavour profiles thanks to the peppery, opposite attraction between the two leads. Reynolds has the straight man role of Michael Bryce, a "triple A-rated executive agent" (aka bodyguard) who has fallen on hard times following the surprise assassination of one of his high profile clients. Jackson, the new assignment Bryce oh-so reluctantly accepts, is the loosey-goosey hitman of the title, Darius Kincaid. Bryce is nominally the good guy in this relationship (the men he protects tend to be arms dealers or corporate accountants), but his anti-social behaviour and obsessive compulsive tendencies render him something of an outsider. Kincaid, on the other hand, is quite comfortable in his villainous skin. He genuinely seems to enjoy his job - particularly the car chases. 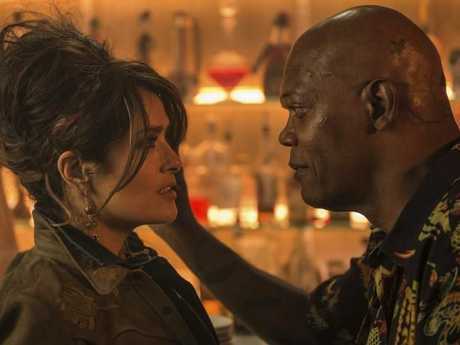 Salma Hayek has just as much fun with her against-type role as the passionately potty-mouthed Sonia, the hitman's badass wife. Bryce and Kincaid are forced to work together when the bodyguard's ex-girlfriend Amelia (Elodie Yung), an Interpol agent, calls in a favour. Kincaid has agreed to testify against Gary Oldman's merciless Eastern European despot, on trial in The Hague for war crimes, in return for Sonia's release from an Amsterdam prison. When the Interpol mission Amelia is leading is violently compromised, she assigns Bryce to the perilous job of getting Kincaid to the UN's International Court of Justice in one piece. Oldman's army of well-equipped henchman, as well as regular Interpol officers and an upper-echelon mole, run plenty of interference as Bryce and Kincaid race against the clock from London to the Netherlands. High-speed car chase sequences, explosive gunbattles and crazy boat stunts abound. 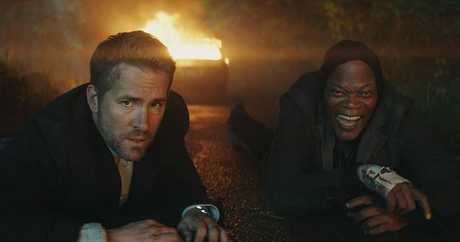 The Hitman's Bodyguard is a pedestrian action comedy with more heavy artillery than it knows what to do with and the plotting is depressingly predictable. But with Reynolds at the wheel and Jackson riding shotgun, it's almost worth going along for the ride. The Hitman's Bodyguard opens tomorrow.